Tata Indicom and Fly Mobile, the mobile handset brand of UK-based Meridian Group, today announced the launch of new handset FLY CG588 loaded with a full Qwerty keypad, mobile e-mail service and on-the-fly access to social networking sites at Rs 4795 . The Fly CG588 has a special active dual-SIM combination of CDMA and GSM, allowing users greater flexibility in choosing their operator of choice. The handset comes pre-loaded with Fly Buzz! a potent combination of Nimbuzz! and Snaptu applications—which help users stay connected on multiple popular platforms, including Facebook, Twitter, etc., at speeds of up to 153 Kbps. 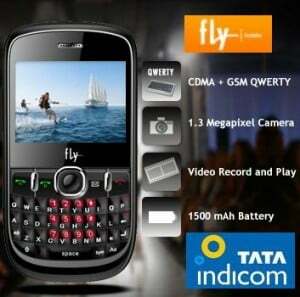 The Fly CG588 is bundled with an attractive offer from Tata Indicom for both voice and data usage. With a first recharge of Rs104, customers will get 1 GB free data usage, 250 local On Net minutes, 250 Local Off Net minutes and 250 SMSs worth Rs1500. With this offer, Fly CG588 will take mobile messaging and social networking deeper into the Indian market, making it easy to access and use for a wider array of the country’s telecom users. Mid-end QWERTY phone with five-way scroll. Fly Buzz!—Combination of Nimbuzz! and Snaptu applications which provide on-the-go access to Facebook, Twitter, Google Talk, Yahoo! and MSN Messenger, Flickr, etc. i do not think it will launch soon. becoz most of the customers use GSM mobiles only,.